The face of the world has been changed irrevocably by the Omega Event, when Azalor Maltheridas finally emerged from his millenia-long slumber within his three towers and threatened to undo all of creation. Six adventurers took up arms against him and his minions, and stepped through the rift he opened to an impossible place to do battle with an impossible foe. It is apparent that they succeeded, else the world - and perhaps all of existence - would have ceased to be. However, in the wake of the Omega, the world faces new challenges. Ancient ruins, once buried beneath the sands and waves, have risen, bearing the promise of treasure for those bold enough to brave their depths - and the monsters that have also awoken with them. A reshaped, scarred landscape causes political turmoil as boundaries are redrawn, and conflict inevitably rises when diplomacy fails. Meanwhile, the nine Forces - the very fabric from which the reality of Trinity is woven - have begun to unravel, losing their strength, and societies reliant upon them begin to sense that, while the end Omega sought has been averted, perhaps it has only been replaced by another. The echoes of what has come linger in time maybe lost. 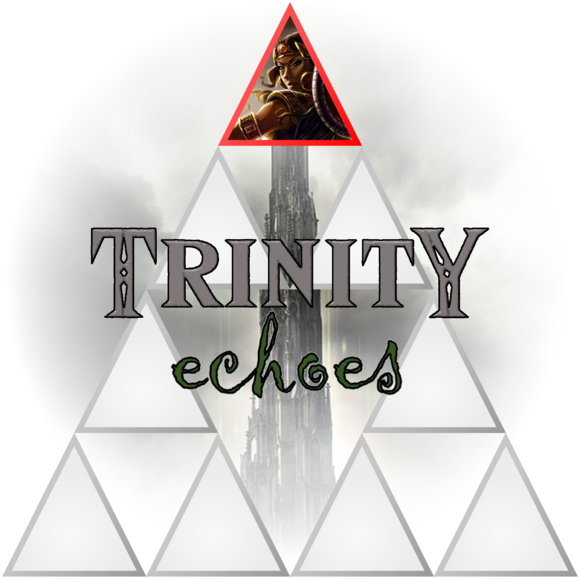 The future of the shattered reality of Trinity is uncertain. The very nature of existence seems to be changing, and as the old guard slowly passes into memory, new individuals must step forward if the truth is to be found and the future saved. Can the decline of civilization be stopped? Can the Forces be revived? Or is all of existence doomed to become a pale shadow, a mere echo of what it once was? Eighteen years ago, a small band of adventurers who had joined together to plumb the depths of crypts in Zalpher found themselves inextricably involved in a nefarious plot by the Sky Pharaoh Hakotep, a Kiltian ruler from a bygone age long since dead. As the mad mummy's pyramids - which had somehow found themselves on one of the moons of Adnez - were launched using technology previously thought impossible in those ancient times, they invaded the pharaoh's personal pyramid and put him down, saving the worlds of Trinity from whatever mad schemes he had in mind. Meanwhile, on Ganymede, the Coldlands Weaponry corporation and her sister corporations of the Corporate Congress have found traces of an incredible find: evidence of an alien spacecraft having once crashed itself into the depths of the planet, seemingly in a time now long forgotten. Together with knowledge gleaned from the future thanks to the Omega Event, the corporations send their soldiers and their scientists deep within the radioactive planet, hoping to find something to stave off the presumed eventual end of Technology. Amidst the turmoil of the day, a small band of adventurers comes together in a sleepy town on the outskirts of civilization to find a missing councilman, but find themselves up against the machinations of an artilect capable of channeling divine power. What strangeness could this be, that a soulless machine is able to call upon a divine patron? What other secrets lie lurking beneath the surface of the tormented planet of Ganymede? This section has all the information regarding the setting: geography, political bodies, lore, and all that of that sort of thing. If there is important mechanical information relevant to a topic, it will typically provide a link to the relevant mechanics page, but note that some mechanics pages have lore in them, as well. This section is home to all of our Trinity-specific d20 mechanics: a mechanical system that, for the time being, is referred to on this wiki as "t20v4." Everything you need to create and play a character within the context of the worlds of Trinity can be found in this section. This section is home to the game system we spent several years developing, called Journey. Note that it is... incomplete, and at this time my efforts are more focused on making t20v4 behave, in some ways, like we wanted Journey to behave. This section is a very rough record of the various metaplots, campaigns, and games played in Trinity, generally using both the setting and mechanics, as outlined above. This section is more for record-keeping, but might also eventually be used to store logs and such for various games. This page was last modified on 16 February 2018, at 07:55.